We are in Gdynia today, a quaint port city in Poland which overlooks the Baltic Sea. Though the city is home to a number of traditional buildings, modern architecture primarily rules the scene. 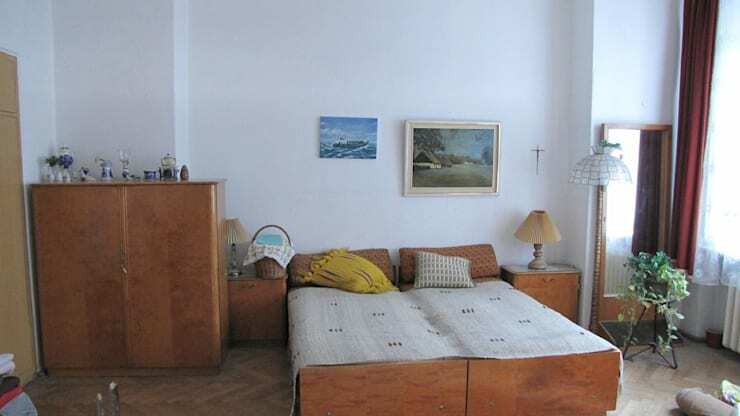 And Mieszkanie w centrum Gdyni is one such apartment here, which was showing undeniable signs of ageing and needed an inspired renovation. 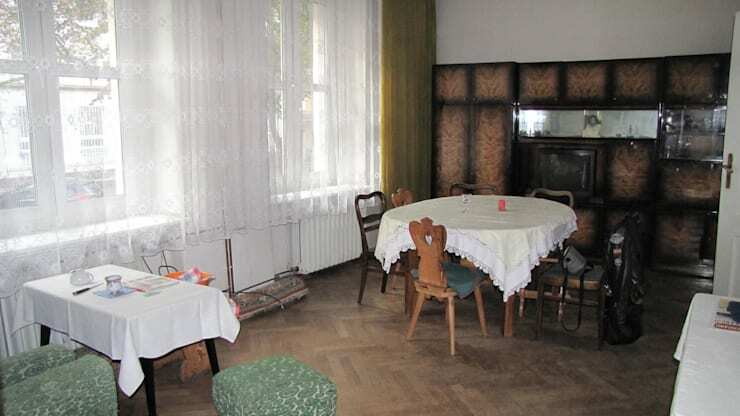 It was full of outdated furniture, dull materials and design elements, and lacked warmth and vitality. Previously, the dull walls and boring flooring of the living area used to lend a depressing feel to the house. But there was enough space to perk up things, and the large windows were a plus too. Repairs were needed and cosy furnishing had to be introduced to liven up the area. White and wooden hues have now come together to create a living space which spells sheer joy and comfort. The chevron pattern on the floor and the brick finish walls add to the visual interest of this zone, and complement the gravity of the grey couch. The large cupboard, circular rug, quirky stepladder and the contrasting cushion are the elements in this room which make you take a second look. Before the makeover, the dining area sported a boring floor and utterly backdated furnishing which might have been stylish at some point of time. The owners were not too keen about this dated look, and wanted something more modern and refreshing. Now, shades of white, grey, chrome and rich wood mark the dining and kitchen space of this residence. 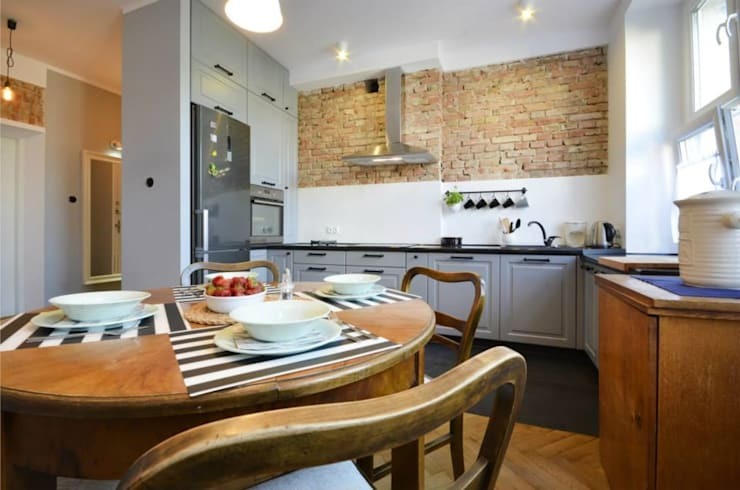 The wall above the sink countertop is lined with bricks which lend an earthy look and feel to the area. Numerous cabinets and drawers offer room for storage, while the flooring has been revamped to reflect the quirky mix of two different textures. The dining table itself along with the chairs are contemporary and easy on the eyes, as boldly striped placemats add to the fun. Worn-out white and wooden hues didn’t do much to make this bedroom look cheerful or invigorating. Despite the presence of artworks and potted greens, the room lacked charm and aesthetic appeal. Even the bedding was a sorry sight. If you step into the bedroom now, you will surely be reminded of cool rolling waves, shimmering sands and a salty breeze. The wall decor says it all! The union of blue, red and white has added some marine zest to the bedroom and makes it appear bright and optimistic. The quirky patterned pillows and the brick finish wall enhance the charm of this space tenfold, along with the clever stepladder which acts as a shelving unit. 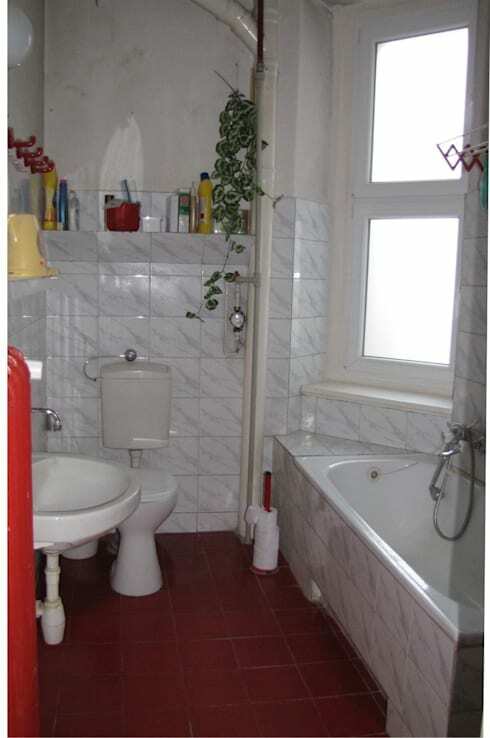 White backdated tiles lined the walls and tub in the bathroom, while dark brown tiles made the floor look dingy. The space sported a cramped appearance with exposed plumbing, ageing wall paint, and insufficient lighting. 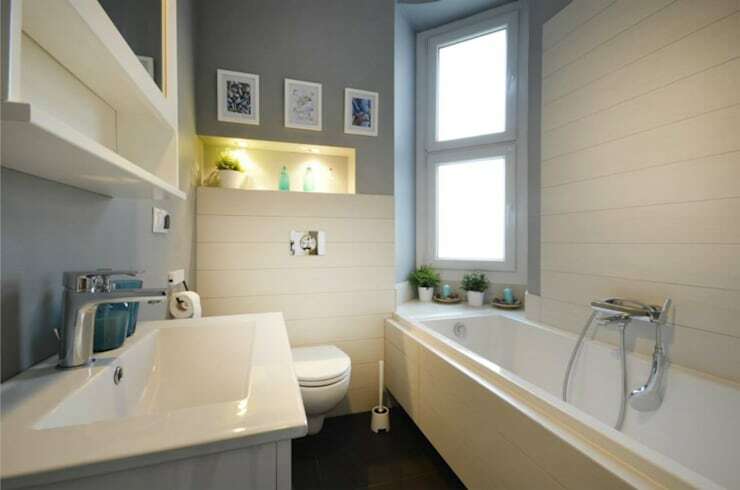 Pristine white and elegant grey now rule the renovated bathroom along with smooth glossy finishes and modern fixtures. A brilliantly-lit niche in the wall above the WC and a mirror with a shelf above the sink provide adequate room for arranging toiletries. A couple of miniature indoor plants and framed artworks complete the simple yet charming look of the washroom. 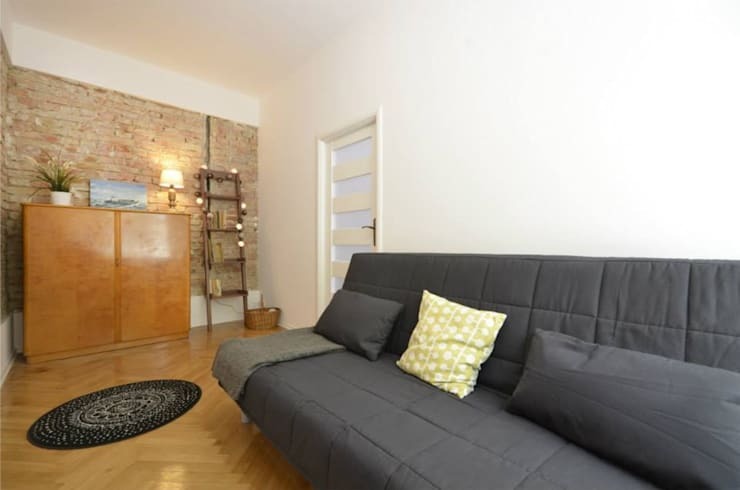 This Polish apartment truly reflects the coastal spirit of the city of Gdynia with its sudden pops of colour, quaint textures and decor accents which are simple but ravishing. Here is another before & after story you can enjoy for some inspiration: A compact home gets an unusual makeover. 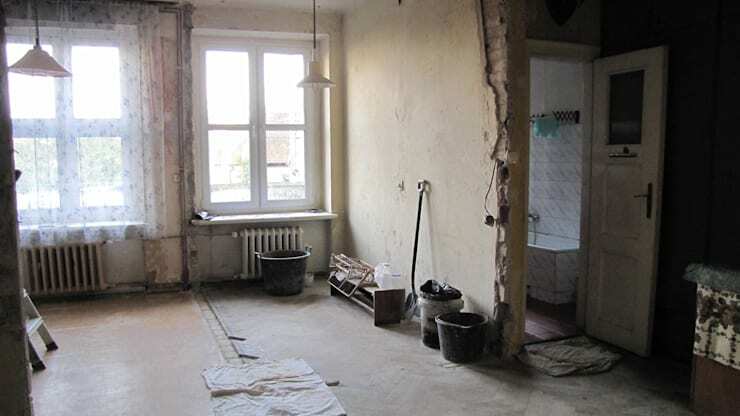 Has this transformation given you any ideas for your own home? Let us know in the comments!